PSALMS 12:6 KJV "The words of the LORD [are] pure words: [as] silver tried in a furnace of earth, purified seven times." 3The LORD shall cut off all flattering lips, and the tongue that speaketh proud things: 4Who have said, With our tongue will we prevail; our lips are our own: who is lord over us? 5For the oppression of the poor, for the sighing of the needy, now will I arise, saith the LORD; I will set him in safety from him that puffeth at him. 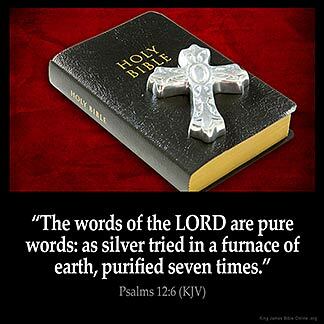 6The words of the LORD are pure words: as silver tried in a furnace of earth, purified seven times. 7Thou shalt keep them, O LORD, thou shalt preserve them from this generation for ever. 8The wicked walk on every side, when the vilest men are exalted. The words of the Lord are true words: like silver tested by fire and burned clean seven times. (12:7) The words of the LORD are pure words, as silver tried in a crucible on the earth, refined seven times. 12:6 Pure - Without the least mixture of falsehood; and therefore shall infallibly be fulfilled. The word of God is truly pure. : undefiled : His word can be trusted. His word is faithful : Because the word of God is purified , that does not mean that it is obeyed by all : there are a select few that do obey His word : act on it There have already been some in God 's word that is recorded that God is pleased with. If we : I love Jesus I will keep His commandments . I want to be one of those that my Lord God will be able to say : ' Well done thou good and faithful servant. " A MEN Robert! Preach!!! Rodney, "The whole world lieth in wickedness " except for a minute few.Our individual responsibility is to trust and obey!While taking every opportunity given,to be ready,willing and able to aid in the ministry of reconciliation.Until our LORD 'S return,or our departure. I am interested in Jeff 's comment as to sources of documentation... not for purpose of argumentation, but for research and credibility. Context is everything: The nearest antecedent to 'them' is words not the righteous or us. Therefore it is the Words of God that are preserved from age to age.